Over the past decade, Myande has undertaken and completed more than 30 refining projects, dealing with oil from soybean, corn germ, rapeseed, peanut, rice bran and other oilseeds. These include 6 refinery projects with a capacity of more than 1,000TPD. Myande also has constructed many refinery lines dealing with special oils, such as tea seed oil, sesame oil, cottonseed oil, etc. In addition to the conventional acid value and colour of the products, modern vegetable oil refining enterprises give priority to index that affects nutrition value and consumer health, such as trans-fatty acids. Based upon this market trend, Myande optimized some production equipment and process technology. Trans-fatty acids are usually produced in the vegetable oil deodorization section due to high deodorization temperature and long deodorization time. According to this characteristic, Myande has developed a new type of parallel bidirectional pumping vacuum combined deodorizer. By using this technology, its packing tower and plate tower have the highest degree of vacuum to make sure that quality of finished oil remains the best and the amount of trans-fatty acid significantly decreases at a lower temperature and within shorter deodorization time. The modern vegetable oil refining enterprises attach importance to the reduction of production cost. They focus on the plant power consumption, steam consumption, fuel consumption, raw material consumption which influence the production cost. 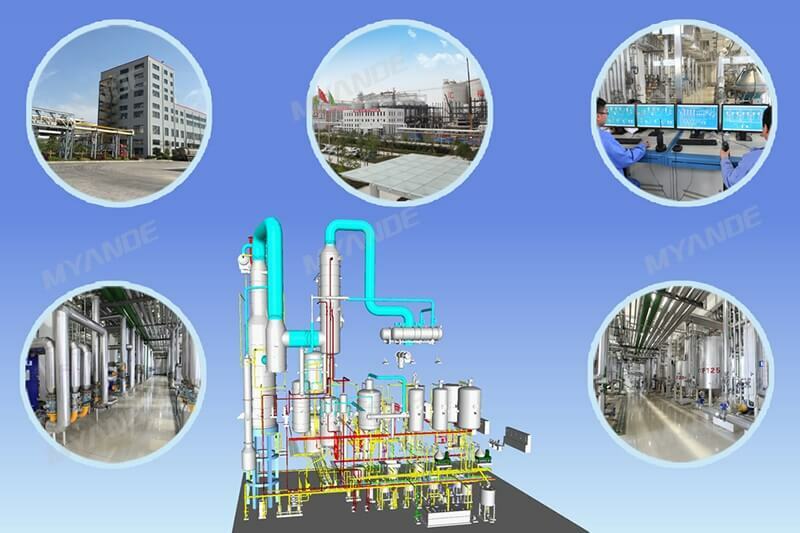 According to customer demand, Myande has designed and developed a new type of deodorization economizer and freezing-condensation deodorization vacuum system. At the same time, the whole production line is equipped with a complete automatic control system. Because of the application of the above technologies, production electricity consumption, steam consumption and fuel consumption have been reduced. Myande refinery projects adopt this new type of vacuum economizer to have the heat recovery of deodorized oil in the deodorization section. It adopts thin film technology to realize effective heat recovery to the maximum extent. At the same time, this structure provides the stripping effect under high vacuum, which helps to keep the oil quality and reduce the generation of non-nutritive substances such as trans-fatty acids. In the refinery projects, Myande adopts this new type of freezing - condensation deodorization vacuum system. This system is the most advanced vacuum system applied in the deodorization section at present. Compared with other types of vacuum systems, it not only reduces the size of vacuum equipment and reduces plant area, but also protects the environment because of the reduction of wastewater. The system is a fully automated operation. It runs stably during the operation. Under the circumstances of the lowest gas consumption and power consumption, it maintains the highest degree of vacuum deodorization system.